In White Water Slalom, athletes have to navigate their canoe or kayak through gates as they work their way through 300m of whitewater rapids in the fastest time possible. Hitting one of the hanging gates poles or missing one completely results in time penalties which are added to the paddler's time at the end of his or her run. A 2-second penalty is given for a touched gate, and if the gate is missed completely there is a 50-second penalty. There are approximately 18-24 hanging gates for each course. The gates are color-coded to indicate which direction the paddler must pass through. Green gates are negotiated heading downstream while red gates require the paddler to reverse direction and pass through them heading upstream. Two runs and the best run counts. Athletes will compete in a surfing competition on a designated wave in SUP and Surf board divisions. Surfers will be scored on their style, flow, length of surf, and tricks. Highest score takes the prize! Athletes are required to supply their own appropriate boards with leash, PFD, and helmet. ​​*Prelims will be held Friday afternoon for Men’s and Women’s Pro classes. Grab your favorite inflatable, dress your best, and show us your best surf! Competitors will be scored for best costume and best wave surf! This event is meant for non-traditional crafts, such as your favorite inflatable tube or crocodile. Competitors are required to supply their own craft, and are required to wear both a PFD and helmet, paddles are also suggested but not required. Entry point and course will be determined day of and provided to competitors at pre-event meeting. The Animas River Days' Boatercross is always a crowd pleaser. Athletes will be placed in heats, size dependent on registration at the discretion of the race coordinator. Racers will compete head to head to maneuver through a slalom gate course, with the top paddlers (1-2) advancing to the next heat. The course will range from the top of the whitewater park to below Ponderosa wave, a downriver gate will designate the finish line. Missing a course gate will result in disqualification. Athletes are required to supply appropriate whitewater kayak, PFD, and helmet. Gloves, full face helmets, and additional protective equipment is strongly recommended. Bibs will be supplied at the time of registration. Big waves and big tricks, the Animas River Days Freestyle Kayak Competition features many of the sport’s top athletes. Durango is home to one of the country’s best whitewater parks and never fails to disappoint. Athletes in each division will compete in a jam session format in an assigned start order. Only athletes within the division will be allowed in the eddy during competition. Each competitor will have 30 seconds to show the judges their best tricks in the assigned wave. If you flush, you lose that turn and it moves to the next competitor. The competitors will keep taking turns until the end of the heat, signaled by judges. All athletes will receive the same number of turns in the hole. Point values will be assigned to each unique trick and a cumulative score will be calculated per athlete at the end of each heat. *Prelims will be held Friday afternoon for Men’s and Women’s Pro classes. 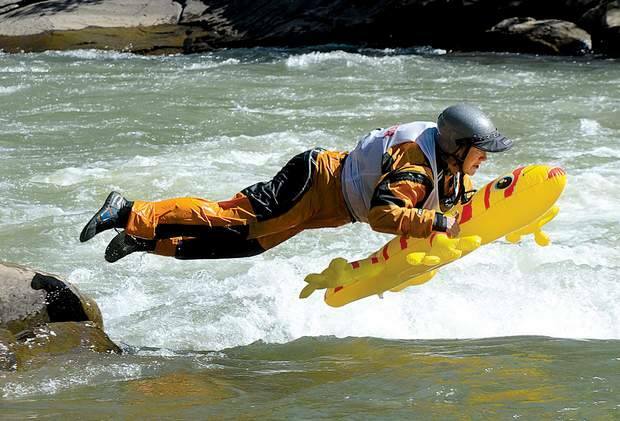 It’s time for Durango’s local raft teams and amateurs alike to strut their stuff! Teams of 4 rafters (no oar rigs permitted) will compete in a slalom course of 8-14 upriver and downriver gates through the whitewater park. Each team will be allowed two runs, with the faster run used to determine placement. Practice runs once the slalom course is set will result in disqualification. One bib will be provided per team at registration, to be worth by the athlete sitting in the front left position. Judgement of the race will be run per International Rafting Federation rules. Full rules may be found at http://www.internationalrafting.com/events-2/race-rules/. Teams are responsible for supplying their own rafts, 14’ boats are recommended but other sizes will be allowed. All team members will be required to wear a PFD, appropriate river footwear, and a helmet. Rafts are also required to have a throw bag, additional shore and kayak safety will be one site. A course walk thru with the race coordinator will be conducted at the time of the pre-race meeting to explain course and penalty rules. Fastest time after penalty calculations wins! To negotiate a gate correctly: 1. The gate must be negotiated in the correct numerical order. 2. All Team Members must be in the raft. 3. The whole head of every Team Member must cross the gate line during a single attempt. 4. No head may cross the gate line in the wrong direction. 5. A Team Member cannot touch a pole with any part of the body, equipment, paddle or raft. Five second penalty: if a gate is touched with any part of the body, equipment, paddle or raft. Reeated touching of the same (or both( gates poles is only penalized once. Fifty second penalty: 1. If the finish line is crossed without all Team Members in the raft. 2. For each gate that is negotiated without all Team Members in the raft. 3. For each gate the raft passes upside down through the gate. 4. For each gate where the whole head of each Team Member does not cross the gate line during a negotiation attempt. 5. For each gate where a Team Member's whole head crosses the gate line in the wrong direction. 6. For each gate that is not negotiated before a higher numbered gate is negotiated or the finish line is crossed. 7. For the intentional displacement of a pole to allow the negotiation of a gate. Intentional displacement is defined as pushing a pole with an abnormal or unexpected action (for example with a paddle or body motion), so that a Team Member is able to negotiate the gate when they are not in a position to do so. It’s everyone’s favorite event! Join us to watch our town dress up, boat the river and put on a show! The Ska beer garden and food vendors will be open, and we’ll have the music playing! Come on out and help us celebrate our wonderful river community!